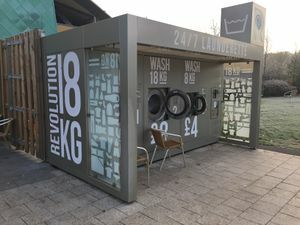 Revolution Self Service Launderette are part of the Photo-Me company, and are a chain of self-service launderettes introduced to Extra's services at Cambridge and Cobham. It was also hoped that it would be rolled out to all of Extra's sites but as of 2017, Cobham is still the only site with one. However, during 2017, a self-service launderette was introduced to the independent Cornwall services on the A30.